sys·tem - An organized set of interrelated ideas or principles. 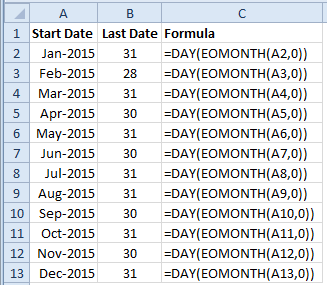 We know that the Excel function EOMONTH(start_date, months) can be used for determining the last date of the month that is the number of months before or after the start_date. But what if we want to find the last date of the current/given month. In this case, the months parameter should be 0. This will return (serial number) the last date of the same month as given in start_date.